Please read all the directions before beginning, and cut your pieces as you go, measuring before each cut. Use 2” screws unless otherwise indicated. Always use glue. Pre-drill and countersink your screws. And don’t forget to check out Knock-Off Wood for more tips! Overall Dimensions are 47" wide, 14 1/4" deep, and 32" tall. 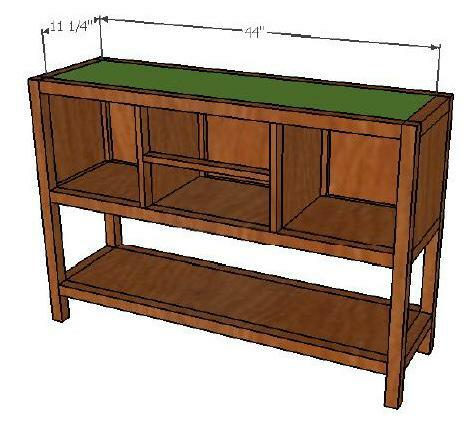 Kreg Jig would be handy-dandy, I'm hoping to get one before I start this project! Start by attaching the side rails (B) to the legs (A) as shown above. The top rail should be flush with the top of the legs, then leave 12 1/4" before the next rail, then 11 1/4" before the bottom rail. This should leave 4" at the base of the legs, as shown above. This would be a good time to use a Kreg Jig if you have one. If not, just be super careful when you drill through the legs into the rails. There is a possibility of splitting the wood when you drill in like that way. Do this to make both ends of the table. Next attach the the front and back rails (D) to the end pieces you just built. Just line up each rail with the ones on the sides, as shown above. This is where I will send you to the coffee table plans. You need to use narrow stips of wood or small L-brackets (G) to create a ledge for your shelves. Take a look back there (step 5) to get the details on it. Once you have those in place, you can go ahead and put the bottom 2 shelves (H) in place as shown above. Now attach the side panels (C) as shown above. They sit inside the side opening and should be flush with the outside edges of the legs and rails. 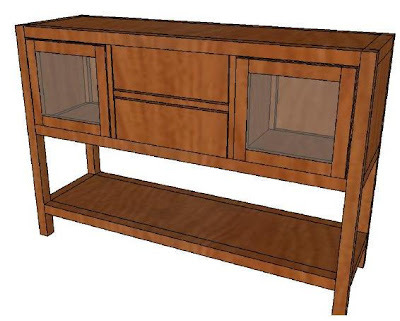 This is similar to the side rails of the coffee table. Now attach the front stiles. 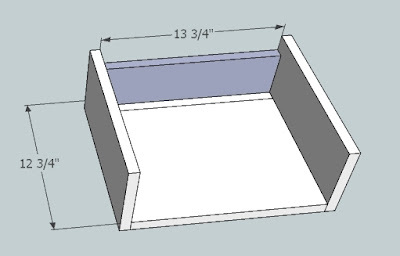 Start with the 2 vertical stiles (E) and attach one in 13 1/4" from each side. Make sure you measure this distance on both the top and bottom rail to make sure your stiles are straight. This should leave a 16" gap between the two stiles. Next attach the horizontal stile between the two vertical stile. It should be centered vertically, with 5 3/4" above and below. Measure the distance on both vertical stiles to make sure your horizontal one is straight. Now put in the compartment dividers. Start by attaching the other 2 vertical stiles (E) in the back. These stiles will be placed the other direction. The front ones have the thin side facing forward, these back ones have the wider side facing forward. 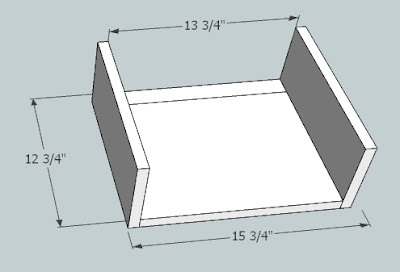 Install these so they line up with the front stiles - there should be a full 16" in between the stiles, and 12 1/2" between the stiles and legs. 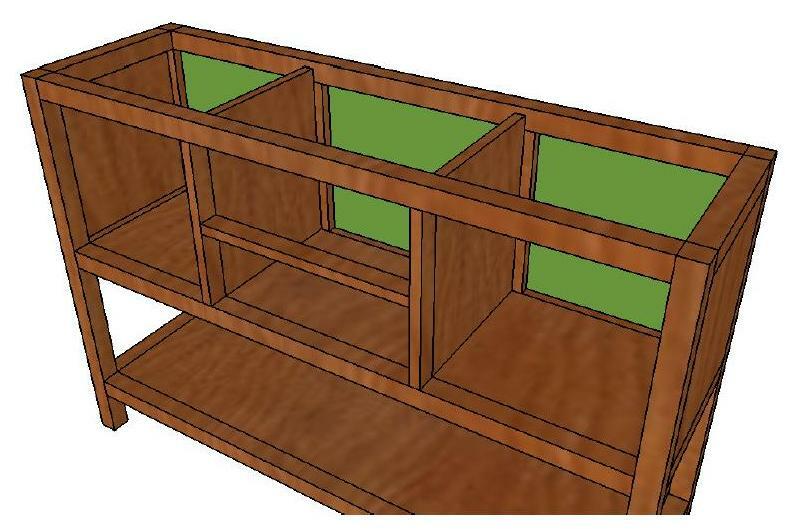 They should be flush with the inside edges of the rails, so there will be room to fit a plywood back behind them. I hope this makes sense. Next install the dividers (I) between the front and back stiles. 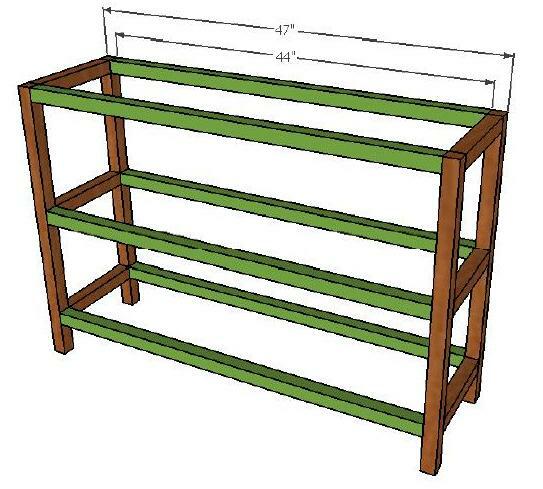 Measure in 13 1/4" along both the front and back rails to make sure your dividers are straight. screw through the front and back stiles into the dividers. Now install the back panel (L) as shown above. You can screw through the panel into the dividers, and through the rails and legs into the panel. 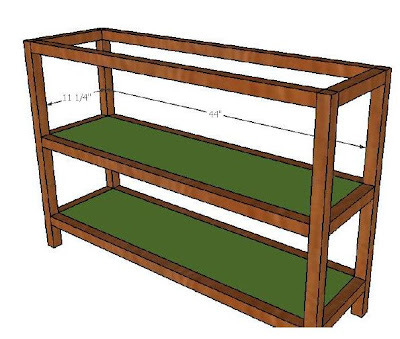 Install the top shelf piece (H) the same way you installed the previous shelves. Now your basic unit is finished. You just need doors & drawers. 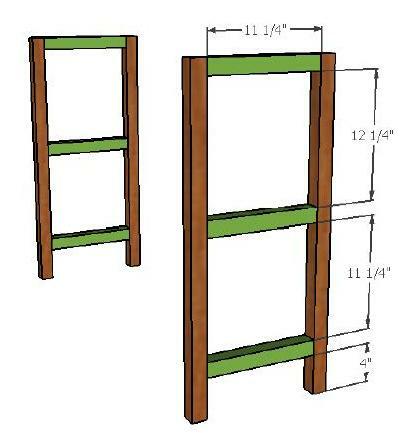 Build your door frame (O & P) as shown above. 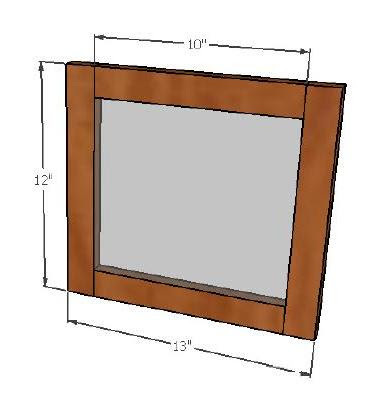 This would be easier with a kreg jig as well, but you could carefully screw through the vertical frames into the horizontal pieces. Make sure you pre-drill. To attach your plexiglass (or glass) I would use pieces slightly larger that the opening and use a silicone glue to attach them to the back of the door. it won't look pretty from the backside, but the front will look fine. Us your hinges to attach the doors to the unit frame. Now we'll start the drawers. 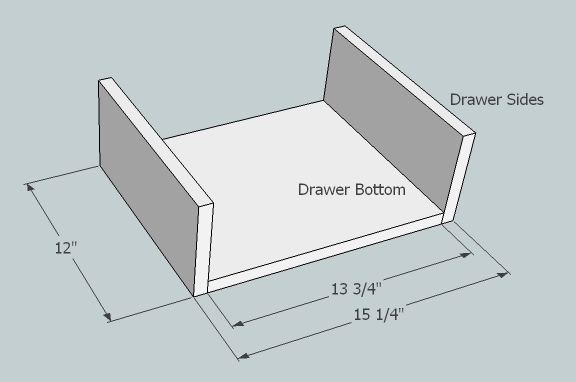 There are two options for creating the bottom of the drawer (K). One would be to cut a piece of plywood to 13 3/4" x 12 3/4" because dimensional lumber doesn't come that size. 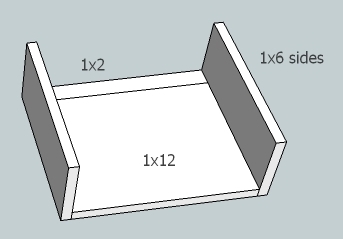 The other option would be (this is good if you have a Kreg Jig) to cut a 1x12 and a 1x2 to 13 3/4" and attach them side to side like this: The two boards together will give you the overall width of 12 3/4" that you need. 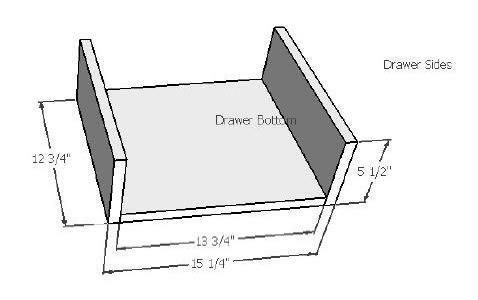 Once you have your drawer bottom, go ahead an attach the sides (L) as shown above, keeping edges flush. Attach the drawer back (M) as show above. 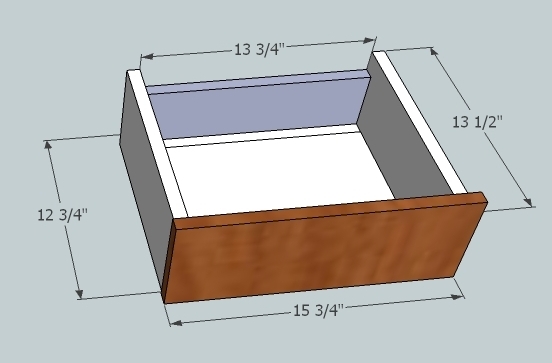 It will sit inside the box you've started, on top of the drawer bottom. I used a 1x4 for the back so the top edge sits lower than the sides, but this way you don't have to cut a custom piece. If you want the edges to be even, you can measure the opening and cut a custom piece. 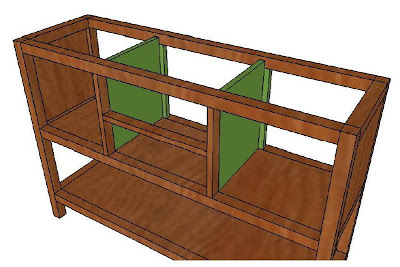 Attach the drawer front (N) as shown above. 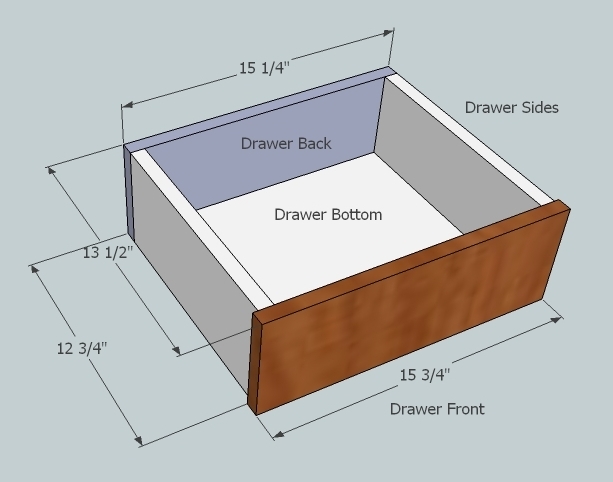 It overhangs the drawer box by 1/2" on each side to accommodate drawer glides. Once your box is done you can install the glides and put the drawers in. Fill your holes, sand, and finish your piece as desired. That's it! If you have any tips or know a better way to do anything, let me know. And as always, check out Ana's site Knock-Off Wood for more tips and plans. Enjoy your new console table! Great job! I hope you build it and show us pictures! One tip I might have is to save putting in the bottom shelf until the last thing. Putting it in before securing the dividers on the upper parts will make getting a drill in there a very tight squeeze. I never would have thought of that, but it sounds soooo sweet! thanks! with four little ones, i've only got the main frame done. Again, i'm loving these plans. Because it's going to have a stone slab on the top and little people standing on that bottom shelf I'm sure, I'm reinforcing it a bunch. i was wondering, I was at Home Depot looking at hinges today and I'm totally confused! What type of hinge should I buy for these doors? Someone at HD suggested small regular door hinges, but the colors they have available don't match my bathroom fixtures. Are the "european hinges" the only way to go? I'm sure I'll mess up that installation. p.s. I found you via Knock-Offs. Thanks! Sweet! I'd love to know what you're doing to reinforce it. The Pottery Barn version uses the regular hinges, and that is all I have used before. I would love to try European hinges, but I would have to find out how because I have no idea! What finish do you need? I've had luck getting specific finishes on ebay so that might be worth a try. Please let me know how it works out! I'd love to see pics if you have any! Changed the top piece, so I'm re-building :) I will email you pics when I'm done! Thanks. BTW...There are "european hinges" available that you don't have to route a hole for. You just screw them on. They were out when I was there, so I'm hoping they'll have some in the next time I go. I'll keep you posted. Thanks! Are you willing to share your sketchup plans? 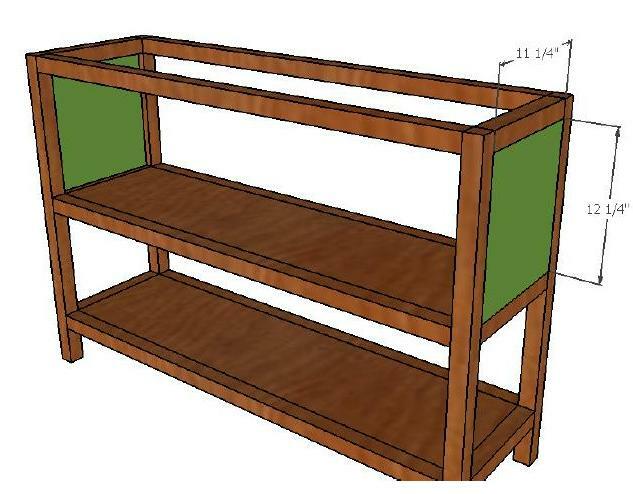 I am planning to build the PB Camp extra wide dresser and this thing is so close to the same general structure. Just would need to pull the front out 6" and each side about 7" or so. Definitely! Do you want me to email it to you? Well, it took me a little longer, but its ready for paint tomorrow now. I started with a 8/4"X 12' chunk of rough sawn poplar and I spent most of last weekend jointing, planing and making the lumber. I dovetailed the drawers too (first try with the dovetail jig - man those things rock!). All in all, came together great. 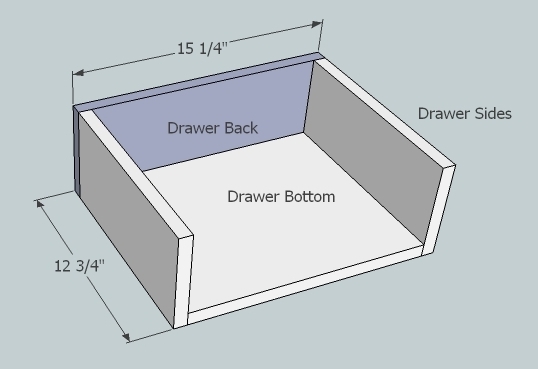 I didn't change much other than making all drawers and pulling the depth out a little bit. I think I will do the console now for our dining room as we think this looks pretty awesome. Great design, and thanks again for the model! I will post more pics when I have the final painted version complete. Altogether - I'm in for about $200 in materials ($85 for ball bearing drawer glides alone) - blows away the Pottery Barn price and I think this thing is way more solid. Elei, I hope the rebuilding is going well! Do you know if you can get those european hinges at Lowes? I would love to try them! Jon, WOW! That is beautiful! You make your own lumber? And dovetail drawers? That is amazing. You are way more advanced than me. :) I'm glad the model helped! This makes me want to build it even more! 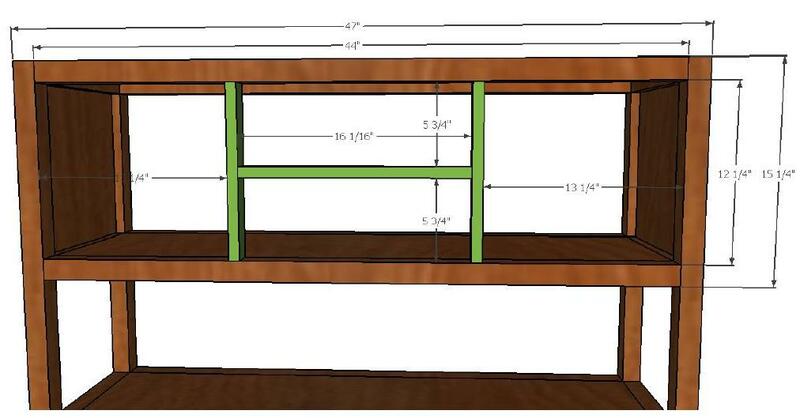 Do you have any advice for changing the dimensions on this, or could you share your SketchUp plans so that I could (try) and change them (I'm new to Sketchup :)) so that I can make this beautiful console fit my space? I love the mixture of drawers of hiding things and an open shelf and glass openings to show off some things. I'm sorry, I think I lost these plans a few years ago when my old computer crashed. If you let me know what size you're looking for I could try to give you some tips! 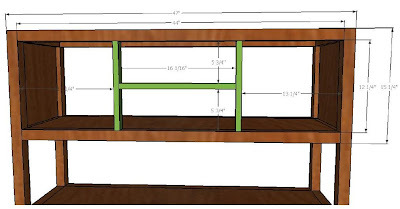 I'd like to build one about 52" long, 18"Depth and 32" High. Any help would be great. I see so many plans out there for stuff I'd like to build but am unsure of how to change dimensions and still keep everything proportional.